The Mexican Revolution was a major armed struggle initialized November 20th, 1910 by an uprising led by Francisco I. Madero against longtime autocrat Porfirio Diaz. 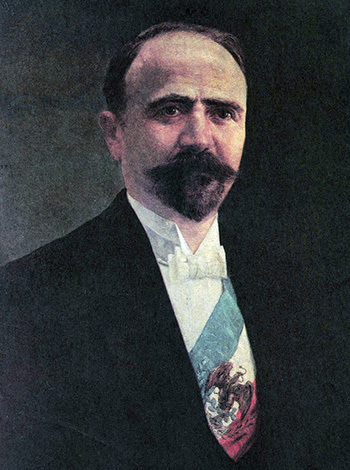 In 1911 Diaz resigned as a president and exiled himself in France. That same year elections were held and Madero was elected President. In 1913 a military coup led by Victoriano Huerta and supported by US ambassador in Mexico, Henry Lane Wilson ended with the assassination of Madero, his brother Gustavo and vice president Pino Suarez. The Revolution was characterized by several liberal and agrarian movements. After prolonged struggles, its representatives produced the Mexican Constitution of 1917. The Revolution is generally considered to have lasted until 1920, although the country continued to have sporadic, but comparatively minor, outbreaks of warfare well into the 1920's. More than a million lives were lost as a consequence of the Revolution War.